Upper structure voicings are those nice sounding jazz chords that almost all jazz pianists are playing. We all know how they sounds like, but maybe we didn’t know what they were called. Also we might not know the structure or the secret behind the upper structure voicings. As usual, I like to simplify things so we understand at least the principles. 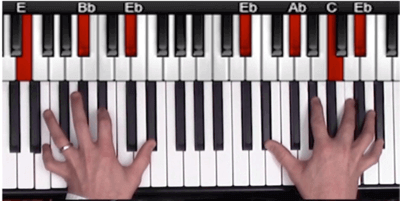 Yet, it will take you some time to master all of the upper structure voicings in all the keys. I still discover new voicings or new perspectives on this subject. – We have 3 main types of chords: Minor7 chords (1), Major7 chords (2), Dominant 7 chords (3). – In this lesson I showed you how to play upper structure voicings on minor7 chords and dominant 7 chords. Whenever you see an Xminor7 chord, you can add certain types of upper-structure voicings. If you see an Xdominant7 chord, you can add other types of upper structure voicings. 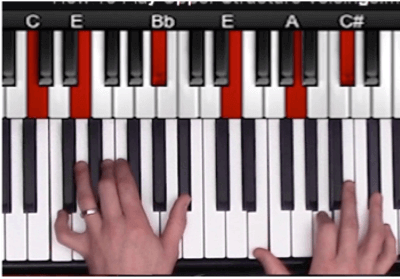 For example you see a Cmi7 chord, you can play a D minor over the Cmi7 chord. 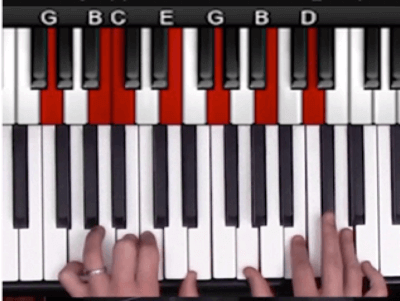 Or: If you see an F7 chord, you can add a D major over the F7 chord. What you add on top of the other chord is what we refer to when you play upper structure chords/voicings. If you’re playing a tune from the real book, you can add upper structure voicings to almost all of the chords. 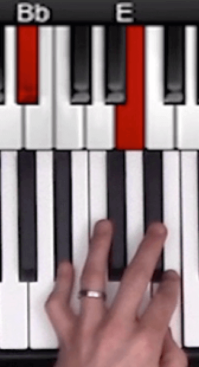 If you play together with others (if you’re not playing the melody), you could play just like written above. Replace the ”normal” chord with the upper structure voicings. 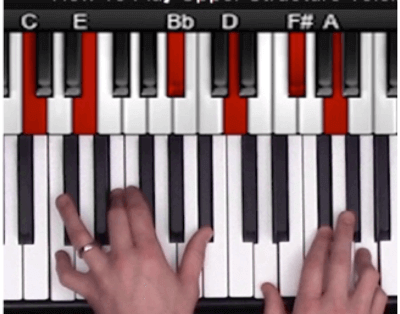 The next version is when you play a B voicing with your left hand (or A voicing). Then with your right hand you can play a major chord a wholestep under the root of the B voicing. D over C7. This results in a C13(#11) chord. A over C7. This results in a C13(b9). Play 3 and 7 with your left hand on the dominant 7 chords. This will free up space for the upper structure chords. 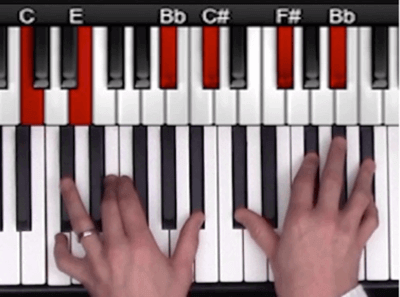 Please note: You may also add the 13 to the left hand, but if you do: only do this on an upper structure voicing that also has the 13th note in the voicing. For example: D over C7 or A over C7. They both have the 13th note (A). Vary the voicings you play when staying on a chord. Since we have so many colors to pick from, we might want to create more tension by varying what upper structure voicings we’ll play. For example: If you stay for a long time on a C7 chord, play different versions of the upper structure chords. Spread out your chords and double one note from the upper structure. This tip is similar to TIP 2, but I’d like to include it as a tip for itself. When you play a tune and the melody repeats (keeping the same chords), the second time you play the melody: try to play a different alteration. 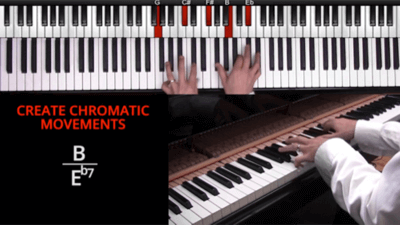 To create a chromatic movement: Go up a half step and back down when you play a dominant 7. If you do this very quick, people won’t notice – and it sounds nice! Fill and improvise by playing the notes from the upper structure voicings. 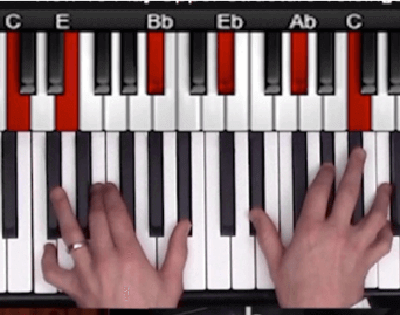 In other words: Use the upper structure chords as tools (cool notes) to play whenever you’re working on improvising. Two: When you improvise over a tune, play the upperstructure voicings as arpeggios and patterns. Are you playing with others? Make sure you listen to whoever plays the melody – so you don’t choose the upper structure voicings that would clash with the melody. 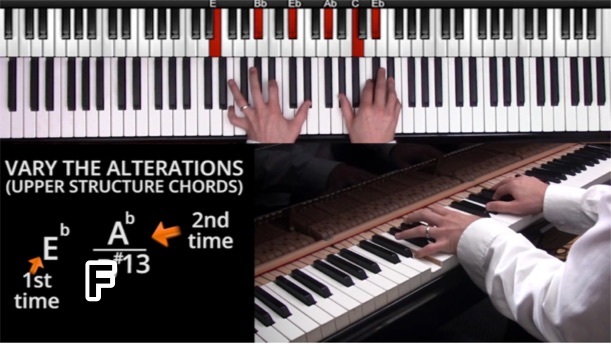 – Play the variations over the II-V-I chord progressions. (If you have a play-along track, that will help you the most). 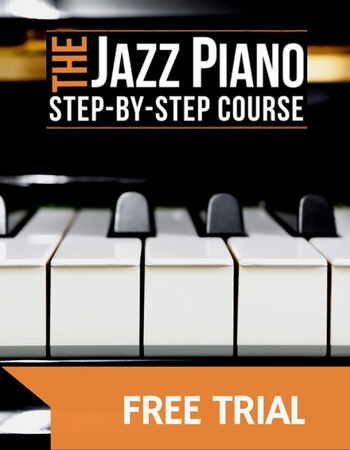 (I cover all of this in greater detail in my Jazz Piano Step-by-Step course). 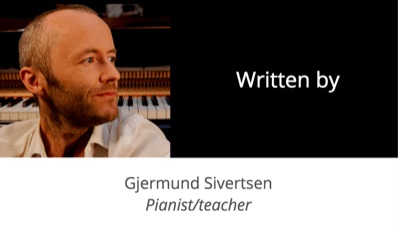 – Exercise: Play the tune that came with this lesson (Download it here). Test the upper structure voicings over the melody. Make sure you choose a variant that doesn’t clash with the melody. One last thing I want to emphasise: Please use your ears for the choice of the upper structure voicings. Make whatever you’ll play come from the inside. It is good to know about how things works in theory, but if you truly want to master the upper structure element you’ve got to get to know each of the voicings so well that you’re ready to improvise these on the spot as you’re playing. In other words: Feed your inner ear with nice sounding chord, then practice them so you’re ready to play them whenever you feel like it. Good luck to you with everything!